Isn't it time you got off the diet treadmill? 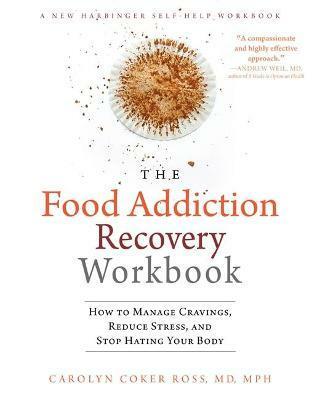 In The Food Addiction Recovery Workbook, physician Carolyn Coker Ross offers the proven-effective Anchor Program (TM) to help you curb cravings, end body dissatisfaction, manage stress and emotions without food, and truly satisfy your soul. If you're struggling with obesity or food addiction, you've probably been told that you must deprive yourself of certain foods in order to lose weight. You may have also been convinced-by the media and by our culture-that if you finally become thin your life will be better, you'll be happier, and your suffering will come to an end. The problem is-it's not all about the food. It's about how food is used to self-soothe, to numb ourselves against the pain of living or to cope with stress and unresolved emotions. Even as your waist whittles away, the problems that caused your food addiction won't disappear. The Anchor Program (TM) approach detailed in this workbook is not about dieting. It's about being anchored to your true, authentic self. When you find your unique anchor, you will relate better to your body, you will know intuitively how to feed your body, and you will reach the weight that's right for you. Anyone who's been on the diet treadmill-losing and regaining lost weight-will admit that losing weight doesn't instantly bring health or happiness. That's because losing weight is a red herring for the real issue, the misuse of food to solve a problem that has nothing to do with food. This book offers a whole-person approach that blends practical information on managing stress and regulating emotions without relying on food. If you're ready to uncover the true cause of your food addiction, you'll finally be able to embrace a balanced diet and reach the weight that's right for you. Carolyn Coker Ross, MD, MPH, is an integrated medicine physician, author, and nationally recognized speaker. She is a graduate of the University of Michigan Medical School, and an alumna of Andrew Weil's integrative medicine program at the University of Arizona. Board certified in addiction medicine, Ross is former chief of the eating disorders program at Sierra Tucson, an internationally acclaimed addiction treatment center in Tucson, AZ. She is currently in private practice in Denver, CO, and San Diego, CA, and is a consultant for the Integrative Life Center in Nashville, TN, and other eating disorder and chemical dependency treatment centers nationally. She is author of The Binge Eating and Compulsive Overeating Workbook, as well as The Emotional Eating Workbook.